The book is comprised of three parts. The ‘Expecting’ series at the beginning of the book shows couples who are parents-to-be. Schwartz has photographed couples in the space they’ve prepared in anticipation of the baby who will soon arrive. The images are titled by listing their names and the amount of time left before their lives will change forever (due date/adoption date). The nervousness and/or excitement shown in the expressions and body language of the expectant parents is palpable. The clutter of all the recommended items for expectant parents in some of the shots is dizzying. Shelves covered with books for what to expect (but can never fully address), or clothes that won’t be worn for months and months after the baby arrives, and the single package of infant sized diapers… as if to declare: “We are ready”. The latter part of the book is the series of images, ‘Empty Nesters’. Presented in a similar fashion as the expectant parents, these couples are parents who are in the phase of life after their children have left home and their bedrooms/personal spaces. The color images Schwarz presents throughout are practically deadpan. Couples are photographed in these spaces in a direct, documentary style. Couples of diverse races, ethnicities, and genders are all presented in the same way. 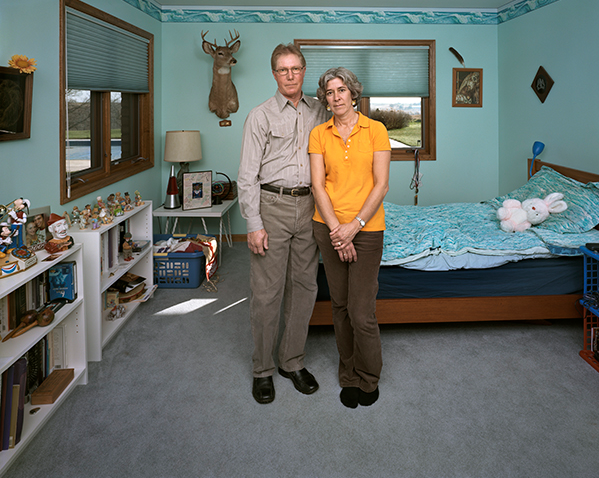 The extreme wide angle lens used to capture these couples in small rooms results in images with the physical space distorted and exaggerated. Tables and chairs are distorted from their normal shape around the frame edge of the shots and the perspective is off – as if stretched by extreme gravity that warps both time and space. One could suppose this is how the Empty Nesters feel… Where did the time go? How did it go by so quickly? What happened to our baby? 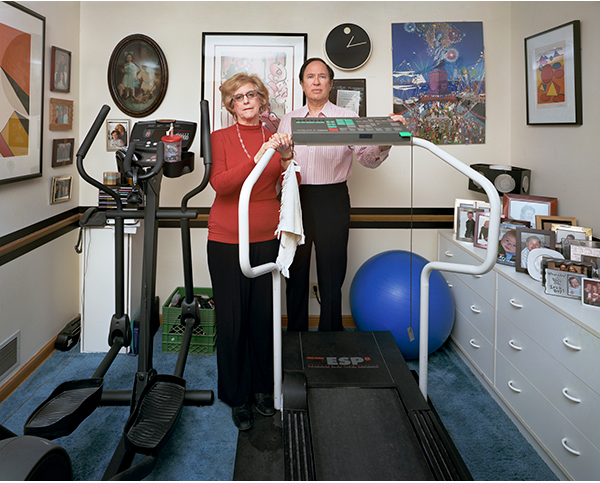 Some Empty Nesters are shown in cramped rooms with some of the same types of knick-knacks as the expectant parents, with the substitution of exercise equipment for bouncy seats, and craft tables for changing tables. The only thing missing is the kids. In fact, the children are never physically present in these portraits; save for photos on shelves or bulletin boards. The details in Schwartz’s photographs, the artifacts, the evidence that time has passed and are the only clues to the real inhabitants of these spaces. These clues are all we have to guess what the children are like – or in the case of the expectant parents: what they hope their children will be like. Dona Schwartz is an American photographer living in Calgary, Alberta, Canada. She earned her PhD at the Annenberg School for Communication and is professionally engaged with photography as an artist, scholar, and educator. Amongst her many academic publications are two photographic ethnographies, Waucoma Twilight: Generations of the Farm (Smithsonian Institution Press, 1992) and Contesting the Super Bowl (Routledge, 1997). Her photographic monograph, In the Kitchen, was published by Kehrer Verlag in 2009. Her work has been internationally published and exhibited at venues including the National Portrait Gallery, London, Blue Sky Gallery, the Milwaukee Art Museum, The Stephen Bulger Gallery, the Pingyao International Photography Festival, and in numerous juried exhibitions in the United States. Her work is included in the collections of the Museum of Fine Arts, Houston, George Eastman House, the Musée de l’Elysée, Lausanne, Switzerland, the Harry Ransom Center, the Portland Art Museum, and the Kinsey Institute. She is currently on the faculty of the Department of Art at the University of Calgary. For more information on On the Nest, and other books by Dona Schwartz, visit her website.